This is a Super-Fix™ is two-part adhesive system developed to fill gaps and voids. 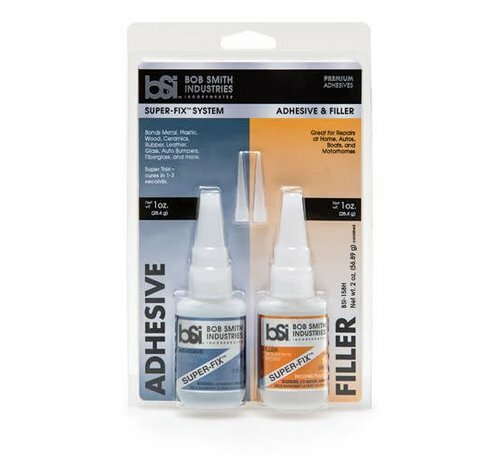 Super-Fix™ is two-part adhesive system developed to fill gaps and voids. It is sandable and paintable and cures in 1 - 3 seconds. Super-Fix™ is great for repairs at home, on autos, boats, and motorhomes. The super-thin consistency is perfect for bonding Metal, Plastic, Wood, Ceramics, Rubber, Leather, Glass, Auto Bumpers, Fiberglass, and more. SUPER-FIX™ FILLER DIRECTIONS: Twist off cap. Apply Filler to gaps in joints or voids to be filled. Apply drops of Super-Fix™ adhesive to the Filler, which will harden instantly. Corners of joints can be strengthened by forming fillets with the Filler and applying Super-Fix™ adhesive to harden them. 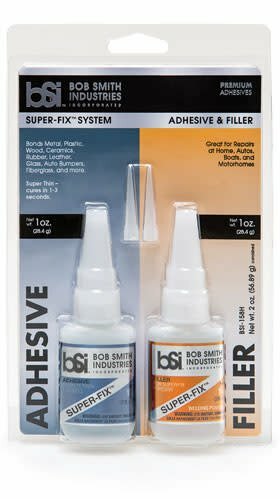 SUPER-FIX™ ADHESIVE DIRECTIONS: Twist off cap. Hold parts tightly together, then apply Super-Fix™ adhesive around seam for instant bonding. 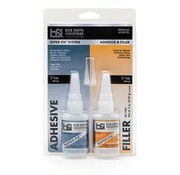 When used with Super-Fix™ Filler, apply Filler first, then the adhesive. Wipe off nozzle and replace cap. Bonds woods, metals, plastics and more.